How does your outbound prospecting stack up? In our work with Sales & Marketing Execs, we're often asked: "What kind of return should I expect from my SDR team's outbound calling efforts?" Often the reply has been "Well, it depends." B2B needs a metric to monitor, benchmark against, and to beat. 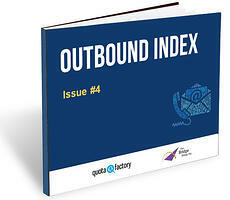 Enter the Outbound Index. "If your sales team is making outbound calls, this is a must read." We rapidly translate what we uncover into the plays, process, and metrics you need to grow. We give every rep the tools, tactics and messaging to prospect and sell like your best. We work with your reps to hone their abilities, spark prospect interest and generate opportunities. With our expertise and bandwidth, our team delivers insight, clarity and guidance.